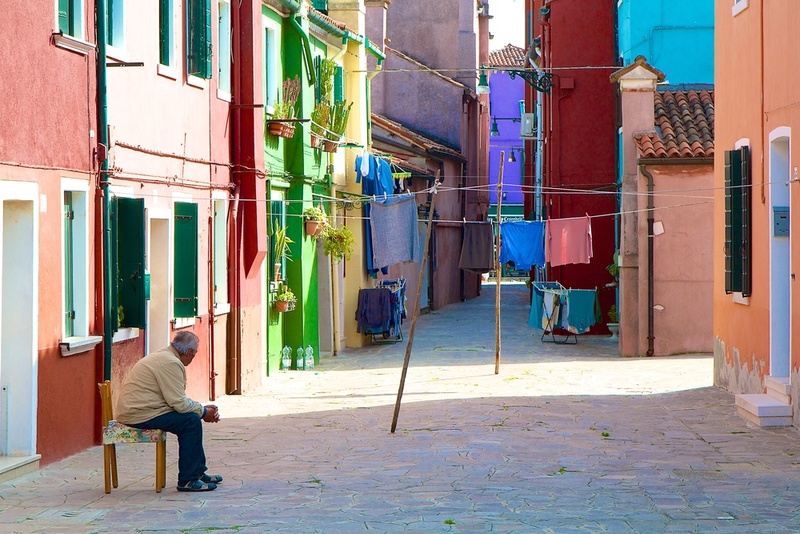 Saturday in Venice… we all figured that we should visit the island of Murano – home of the famous glassworks. A woman from our hotel in Venice arranged for a free private boat to drop us off/pick us up at the dock of one of the major glassmaking operations on the island. 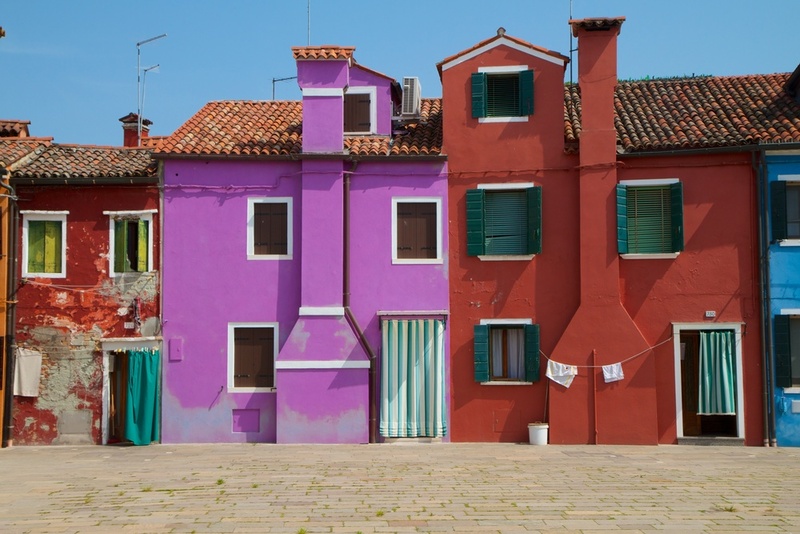 As I stepped onto the boat with my camera daggling from my waist, she suggested that from Murano, we might want to visit the neighboring island of Burano – a tiny fishing village known for its colorful houses and picturesque seafront. It’s quite photo worthy, she said. But if we did go on to Burano, we’d have to find our own transportation back to Venice on the various Vaporetto lines. In Murano, we were met at the dock by a guy in a suit (Vladimir) who took our small group into the factory, where a lone glass-blower was working that day (because it was Saturday). This guy’s glassmaking demonstration was impressive, but not nearly long enough. After a couple of glass figurines were miraculously shaped out of molten glass, we were ushered into the gallery, comprised of several rooms full of glass chandeliers, vases, dinnerware, figurines and other glass bric-a-brac of all shapes and sizes. There seemed to be no exit, only room after room of low, potentially head-banging Murano glass. I tried to seem interested in the sales pitches (Really? Only 2,000 euro for that piece? Including shipping? ), but mainly I just wanted to escape without breaking anything. Photos were not permitted, but my camera accidentally took some snapshots. Debra was eying one of the chandeliers when a salesman asked her what room in her house she was considering for a chandelier. When she replied that she thought she’d have to get a different house, he simply turned and walked away. He obviously has no sense of humor. Eventually, they finally figured out that they weren’t going to sell anything to us and showed us the way out. Burano was a 30 minute Vaporetto ride from Murano. As we approached the island, I could tell that it was something special. After a 2-hour lunch in an outdoor cafe, the four of us then split up, and for the next couple of hours, we each wandered around on our own in the alleyways of the stunningly beautiful island. Brilliant sunshine from a cloudless sky made the colors of the buildings really pop. 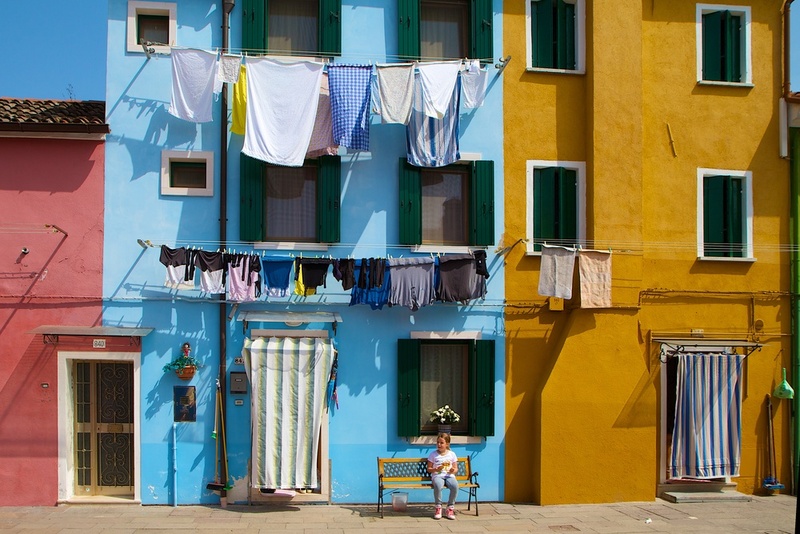 And it was obviously laundry day on Burano. 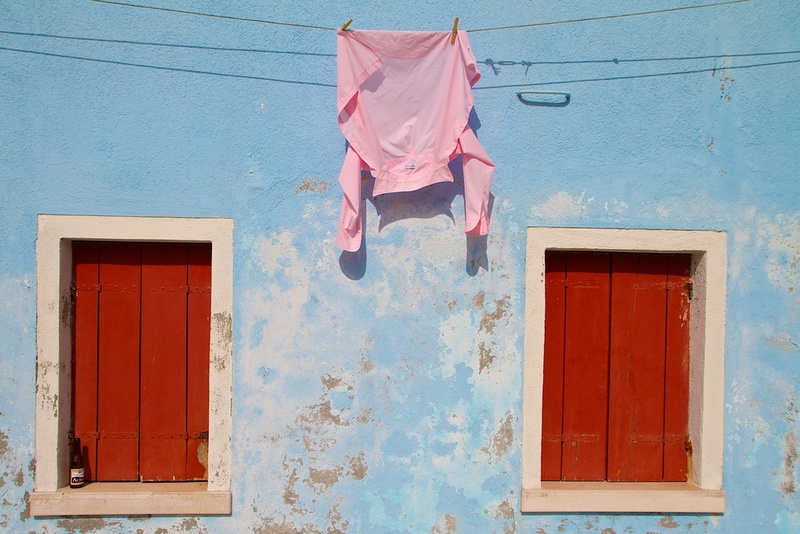 Or maybe every day is laundry day on Burano. Or maybe all those clothes are just props for the benefit of the tourists. Whatever the deal is, it really works. I’ve never seen anything quite like it.